The National Council for Osteopathic Research (NCOR) was established in 2003 to provide leadership and unity in osteopathic research development. NCOR aims to improve the osteopathic evidence base by fostering research, increasing research capacity and capability within the osteopathic profession, and raising the profile of osteopathic and osteopathic relevant research findings. NCOR is a coalition of stakeholder organisations concerned with the quality of osteopathic patient care. The stakeholders for the National Council for Osteopathic Research meet formally every 10 to 12 weeks to discuss progress in relation to its mission statements and aims. Dr Dawn Carnes, was appointed Director of NCOR on 1st May, 2012; Dr Carnes is a Senior Researcher at the Centre for Primary Care and Public Health at Barts and The London School of Medicine and Dentistry. Dr Carnes was preceded by Professor Ann Moore, who was appointed the first chair of NCOR on 1st March, 2003. NCOR was based between 2003 and 2012 at the Clinical Research Centre for Health Professions at the University of Brighton. 1. Strategic leadership: to lead and facilitate osteopathic research development in the UK, including developing a comprehensive and cohesive research strategy providing both direction and coordination of osteopathic research. 2. Advocacy: representing the profession on matters relating to the osteopathic evidence base and research development. Acting on behalf of the profession, in a research context, to the media, the public and patients, policy-makers, the inter-professional research community, other health professions and healthcare regulators. 3. Research education: to provide a forum for the Osteopathic Educational Institutions (OEIs) through which to forge consistent standards in research governance, to share expertise, achieve economies of scale, and foster undergraduate and postgraduate research collaboration. To promote research capacity and scholarship. 4. Information resource: to provide osteopaths, the public and patients, healthcare professionals, and the research and academic community with a recognised, high quality and accessible resource of research-related information concerning the distinctive body of knowledge within osteopathic practice. 5. 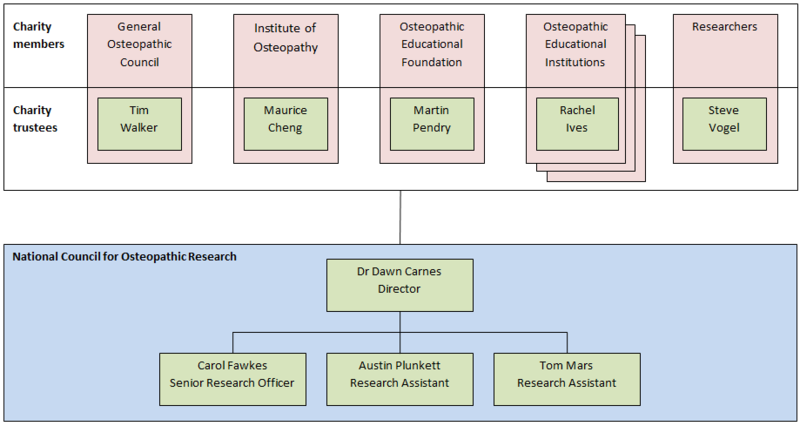 Liaison and promotion: to improve awareness of osteopathic research development amongst osteopaths and the wider community. To establish links and build networks within the research fraternity, nationally and internationally, with a view to development through collaboration. To formulate and foster strategies for attracting funding for osteopathic research development. 6. Research Governance: to provide systems relevant for grants governance and research governance for the benefit of all stakeholders. 7. Knowledge Transfer: to foster and disseminate outputs from osteopathic audit, evaluation, and research activities via, for example, an annual research conference.